2016 will be a watershed year for digital media in the US. For the first time, digital will overtake TV ad spending by the end of the year. eMarketer estimates US digital media ad spending will top $72 billion in 2016, vs. $71.29 billion for TV. Paid media spending will rise by 6.9% in 2016, marking the strongest growth rate in more than eight years. Ad spending has been driven by the US presidential election and the Rio Summer Olympics, which have generated incremental ad expenditures beyond expectations. 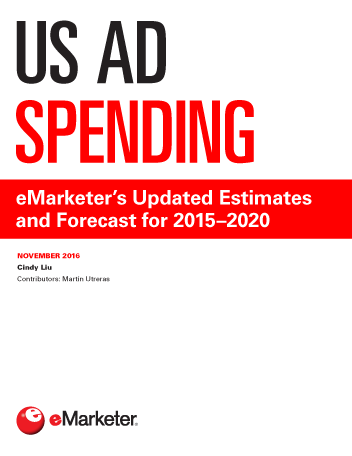 eMarketer expects growth to taper in 2017, but remain strong at 5.9%. Strong digital growth will continue for the next several years, climbing from $72.09 billion in 2016 to $113.18 billion in 2020. Google and Facebook will take the lion’s share of digital ad revenues—about 58% in 2016. Mobile ad spending is the main reason for digital media’s growth, with investment rising from $45.95 billion in 2016 to $86.84 billion in 2020. More than 23% of total media ad outlays—and over 63% of digital—will be spent to reach individuals on mobile devices like smartphones and tablets. Advertisers are devoting more of their digital spending dollars toward video, rich media and in-feed ad placements, most often found on social networking sites. Collectively, these display ad expenditures will surpass that of search in 2016 and will capture half of all US digital ad spending by 2020. TV ad spending is still growing, rising 3.5% in 2016. In fact, eMarketer increased its 2016 TV projections due to higher spending tied to the Olympics, the presidential election and a strong scatter market. "Nearly 37% of US paid media investments will go toward digital channels in 2016. This share is expected to surpass 46% by 2020, at the expense of TV, print, radio, directories and out-of-home (OOH) advertising."